Unlike most of the other pages on this site, this page deals with stations familiar to everyone on the network that have never closed but none the less have areas underground that have become disused over the years. I've already dealt with one special case already in detail on the section titled Hidden Holborn. Occasionally, as you walk the tunnels between the platforms of a station or as you walk up to the surface you'll notice passageways that lead off into the distance yet you're prevented from walking down them by a gate or grille. In fact, in most cases, these tunnels are unlit and the walls are filthy! Contrary to popular belief, these passageways on the whole don't lead off to secret government laboratories or are not secret tunnels to Buckingham Palace or the Houses of Commons (people have seriously told me these things in the course of my research!) In fact, many of these tunnels are legacies of the early days of the stations. When the underground network was first devised and built, escalators hadn't been invented - access to all the deeper stations could only practically be made with a lift. The invention of the passenger elevator (along with new tunnelling techniques) was one of the innovations that made deep level underground stations possible in the early part of the 20th century. In fact, almost all the deep level stations on the Central, Piccadilly, and Northern lines were originally built for access via elevator, with a spiral emergency staircase built in a secondary smaller vertical shaft. As the use of the stations increased and escalators became more widely available, most of the busy stations were converted for escalator use. This meant new diagonal shafts at 30 degree inclination were being built to accommodate the escalator and often required the surface station to be relocated to allow for the new stairway, the most recent example being Angel, which moved about 100 yards from its original location when escalators were built. This left the lift shafts, with their access tunnels, often going in a different direction to the newer passageways to the escalator, which were more often or not simply abandoned. Many of the shafts abandoned during this time are still there today. The picture opposite is a good example of one of these. 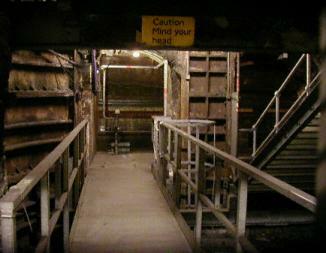 Taken in Charing Cross' Bakerloo Line section (originally Trafalgar Square station), the original course of the emergency stairs can clearly be seen. When escalators were added, the stairs became redundant and a new larger ticket office was built immediately above the old shaft. 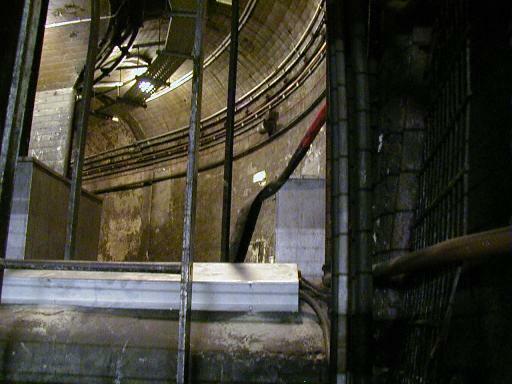 The Charing Cross shafts are completely hidden from public view, but in many stations the public can still see these. A good example where the tunnels and abandoned lift shaft can clearly be seen is at Shepherd's Bush station on the Central Line. As you approach the escalator, a grimy passageway can clearly be seen leading off out of sight. From the foot of the escalator turn right, then right again and walk up past the emergency staircase. Before the end of this passageway a grilled entrance can be seen - through the gateway a large dark empty space can be seen - the old lift shaft, now empty. At one time, the grimy shut off passageways were once used to access the opposite side of the lift shaft providing one way entrance and exit access. Another example can be seen at St. Paul's station. If you take the escalator down to the lower platform (unusually, the platforms are one above the other at St. Paul's) you will be able to look up and see some passageways leading off to your right, accessed by a ladder and a shut gateway. In times gone by, these would have been the tunnels that took you to the station's lift. There are also access points to these passageways on the platforms themselves hidden behind black locked grilles. A while ago I was able to walk down these disused and now very dirty (and smelly) passageways and stand at the bottom of the now empty lift shaft. Traffic noise and the pealing of St. Paul's bells could clearly be heard eerily echoing down the shaft's dark walls. Or, look through the black grilles at platform level (and interconnecting tunnels, which used to house the lift doors) on South Kensignton's Piccadilly Line platforms to see yet another lift shaft. If you look carefully through the Westbound platform's grilles you'll see a door on the opposite side which I'm told leads to the deep level platform area intended for the never built extension of the Metropolitan Line (discussed below). Just as with Angel, the change in station location due to the conversion of a station from elevator to escalator can be seen on the surface at Hyde Park Corner. 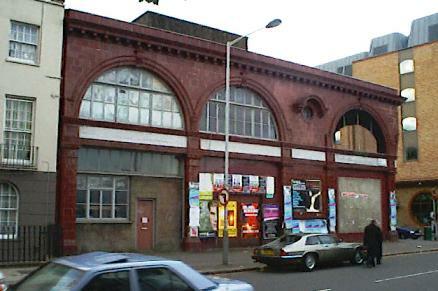 Today, two hundred yards from the current station entrance lies a building with an ox blood red facade so typical of Piccadilly Line underground stations. Indeed this was the original lift entrance to the station but you won't catch a train there today - just some of the world's best pizzas! The restaurant manager showed me that just behind the staff door at the back of the restaurant, some original station tiles still exist. Update 2013: London is a changing city. Sadly for me, Pizza in the Park is no more and the surrounding buildings have been subsumed into a new hotel. 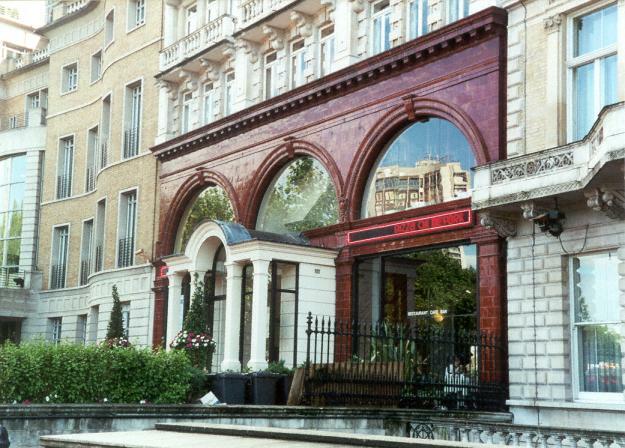 The old station facade is a listed structure and is now part of the hotel's frontage. 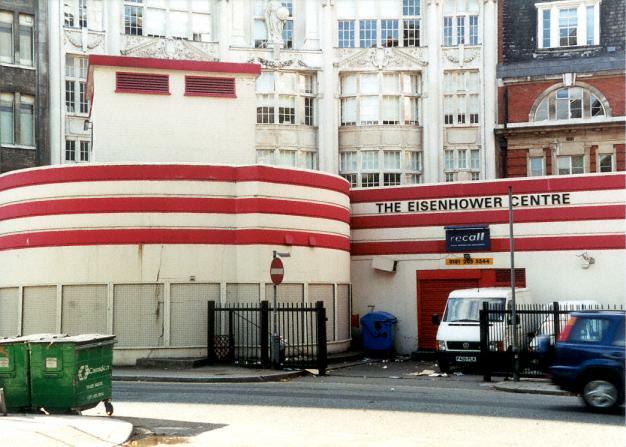 The photograph below shows what looks like another derelict and disused underground station but it is in fact the old surface building for Euston station, now relocated 100 yards away inside Euston mainline station when the escalators were built. Evidence like this can still be clearly seen in many other bustling stations. Be careful as you look through the grilles and gates though - they're often covered in soot! I once walked around for a while with a black nose before someone was kind enough to point it out to me (amid much mirth and laughter). Many of the stations on the Underground have over the years gone through refurbishment; new more fashionable decoration was applied to walls and in many cases the original station decoration was completely lost. But not quite - since the old lift shafts and in many cases the tunnels leading up to them were no longer in use and out of sight, they were left alone. 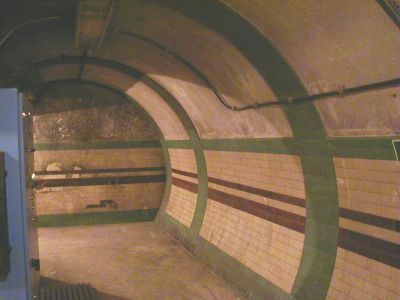 The photograph below shows a good example where the original Yerkes tiles are left intact in the abandoned lift concourse near the otherwise completely re-developed Charing Cross Bakerloo Line platforms. As congestion on the Northern Line increased in the '30s, a plan was developed to build a second tunnel that would act as an express route beneath the existing Waterloo branch of the Northern Line. These plans were shelved at the outset of the Second World War, but as the platforms of the Underground became increasingly used as air raid shelters, work began on building second tunnels along the route of the new extension, beneath the existing tunnels. 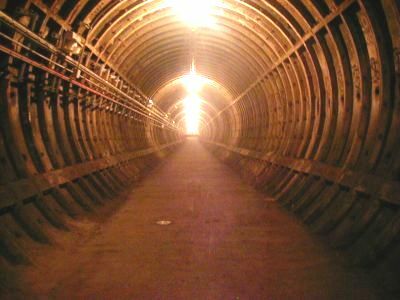 Find out more about these tunnels that exist beneath several London Underground stations, about how they were used as shelters during the Second World War and also how they continue to be used today. There you will also find a contemporary visit to one of these stations along with many photographs. Other tunnels and shafts still remain as a result of the original construction of lines and stations. Access shafts were built at regular intervals along the deep level lines for the removal of spoil; stations were located at most of these but one or two now exist only as air ventilation shafts (or as abandoned stations, like Down Street or Brompton Road). During the refurbishment of Charing Cross station in the early 1970s when Trafalgar Square and Strand station were combined to form a single station, a large amount of construction work was needed to excavate the vast amount of rock and earth to create the new tunnels. So that this work could take place, a new shaft was sunk. A pair of access tunnels were bored, one for the Jubilee line and another for the concourse. As you walk down the tunnel that connects the Northern Line platforms with the Bakerloo line, you'll see a grille to your right, which could easily be mistaken as a small storage room. This is in fact one of the access tunnels to the construction shaft (now blocked up) - and surprisingly it goes on for well over 100 yards before arriving at the bricked up shaft, as can be seen in the photograph below. Today, the tunnel goes no further and is now a dead end. 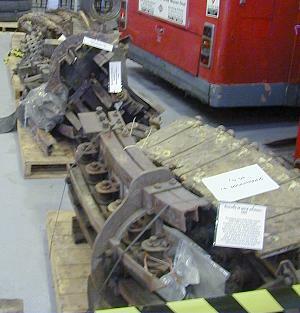 The escalator was almost completely removed not long after its installation, but a few years ago a small section of the escalator was recovered in the sump of the lift shaft and is now preserved in London's Transport Museum's Acton Depot. Carefully looking through the grille that covers the entrance of the second lift shaft, you can see the escalator's original location along with the more modern metal emergency staircase that has more recently been fitted (as seen in the photograph above). All material on this page is © 2001 Hywel Williams unless otherwise noted. Charing Cross photographs taken June 1st 2001. Acton Town Depot photograph taken 15th July 2001.